Mercury in Toronto region plummeted to minus 30⁰ C, with the wind-chill it felt minus 35⁰ C to minus 40⁰ C soon after Christmas of 2017. The freezing temperatures continued through for the first week of January. The New Year eve of 2018 was the coldest New Year’s Eve in 158 years. Quebec recorded frigid minus 49⁰ C. Taking Maximus out on a walk during these days was bit difficult. We shortened our walks to about 15 minutes. 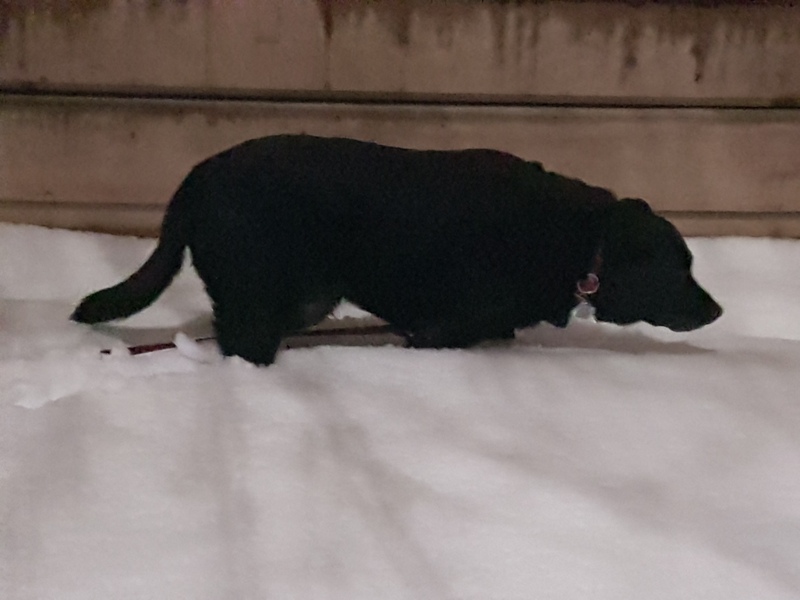 I always walked on the sidewalk which the city had cleared of snow, but Maximus – he is a Labrador Retriever from Canada – obviously he enjoyed the cold and the snow. He preferred walking in the snow with his legs buried. This record-breaking stretch of cold weather started when a mass of abnormally warm air moved up the western side of Canada and settled over the North Pole. That pushed a huge mass of frigid air known as The Polar Vortex southwards into Central and Eastern Canada. A polar vortex is an upper level low-pressure area circulating around both of the Earth’s poles, an upper level feature in the troposphere and extend into the stratosphere. It may not be felt directly on the Earth’s surface. It acts as a heat pump that moves extra energy from the tropics towards the poles and keeps the Earth’s temperatures in balance. Polar Vortex weaken in the summer and pick up strength in the winter. Due to the rotation of the Earth, this circulation is counter-clockwise in the North Pole and clockwise in the South Pole. 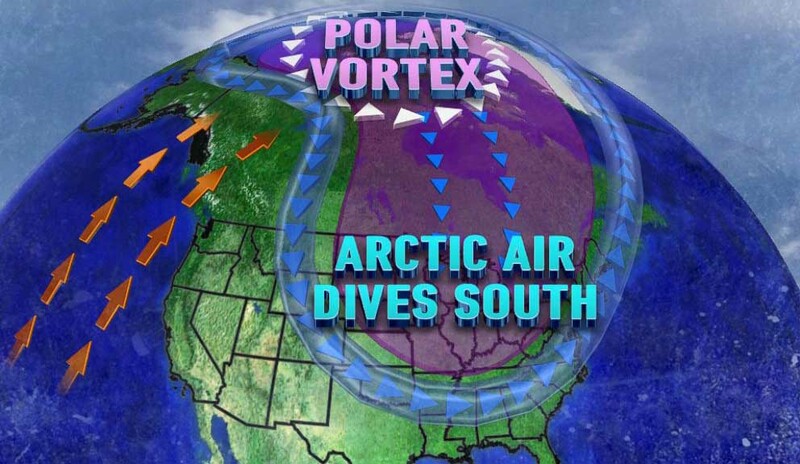 The cold air gets locked into the Polar Vortex and can be scientifically explained by Coriolis/ Magnus effect. This could well be added to the reason why the spin bowlers of the Indian cricket team (Northern Hemisphere) are ineffective in Australia and South Africa (Southern Hemisphere) and vice-versa. The outer edges of the Polar Vortex – a low pressure conveyor belt like circulation above 60⁰ Latitude – ensures that the cold air remain in the polar regions, like water being held in a dam. When the warm air from the equatorial region moves towards the poles, the dam like edges weaken at places. This results in the Polar Vortex getting elongated towards the equator like a sheet of dough or chewing gum being pulled. This winter, the elongation of the Polar Vortex covered Central and Eastern Canada, going down south to touch Florida in US. As this elongation of Polar Vortex escaped Western Canada and Alaska, while Toronto was freezing, Alaska – much North of Toronto – enjoyed warm weather with mercury at plus 5⁰ C, about 20⁰ C above the average winter temperature. The outer edge of the Northern Polar Vortex is like a conveyor belt moving counter-clockwise. It is at a much lower pressure and when it collides with warmer air and when the pressure rapidly drops by at least 24 millibars in 24 hours. This causes ‘Weather Bomb’ or ‘Bombogenesis’. The effect of Polar Vortex this time ended with a Weather Bomb, resulting in a storm that dumped snow on the Southeast of Canada and US and delivered near hurricane-force blistering winds, with record-breaking cold. Florida in the sunny south also experienced snow this winter due to this Weather Bomb. 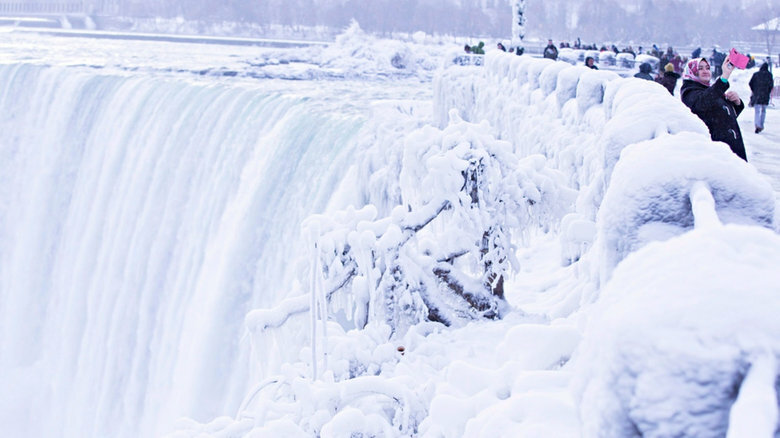 Did Niagara Falls freeze this winter due to Polar Vortex? The Niagara was not frozen and probably never will. It may appear to a viewer that parts of Niagara Falls are frozen. It is due to the miniature glaciers and long icicles forming around the mouth of the falls, but water continued to flow beneath the ice. The mistaken frozen appearance could also be due to increased diversion of water, a kilometer away from the falls, through tunnels and canals for hydro-electric purposes. In winters about 75% of water flow is diverted and in summers about 50%, obviously to give a better view to the tourists. With less water going over the falls, there is more scope for ice build up, giving the appearance of frozen falls. The only instance when Niagara Falls nearly froze occurred in March 1848 when a preponderance of ice above the falls reduced the flow of water to a trickle. However, there are lots of images floating over the internet claiming to show Niagara falls in a frozen state. Power Companies have been generating hydro-electric power from the Niagara River since the 1880’s. The ice floating on the river at the mouth of the tunnels reduce water flow into the turbines and may also jam the tunnels. To avoid such a havoc, an ‘ice boom’ – 2.7 km long, made of floating 30 feet long steel pontoons – is installed each fall since 1964 by the US Army Corps of Engineers. 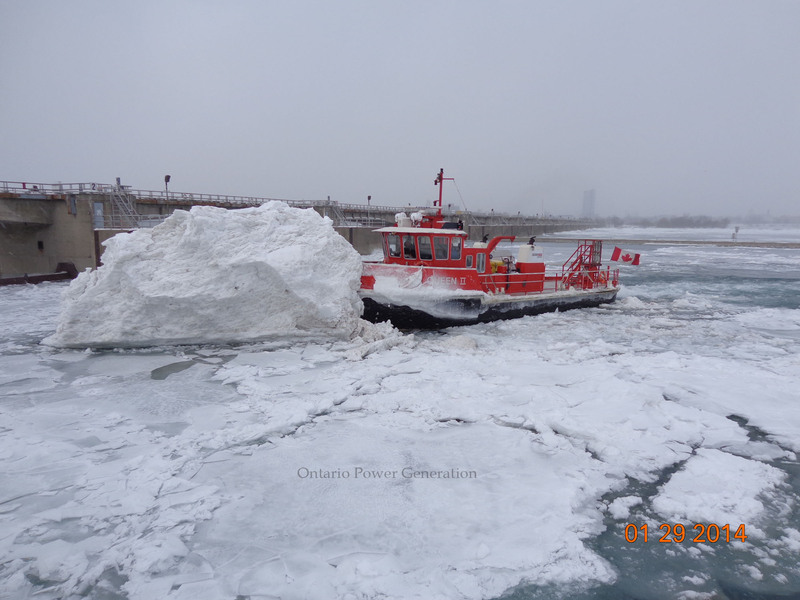 During the winter season, the ice breaking boats work at breaking ice formations in the river that may hinder the flow of water into the hydro water intakes along the American and Canadian shoreline. The boats are operated by the power generation companies. To read my Blog Post about the Niagara Gorge, Please Click Here. Article on cold and chill ended on a warm note, !! Wow, Yet another detailed note with lots to learn and understand, loved reading it Sir.